In a bowl, combine the cider vinegar, lemon juice, mustard, honey, and slowly drizzle in the olive oil while whisking constantly until incorporated. Add the dill and season with salt and pepper. 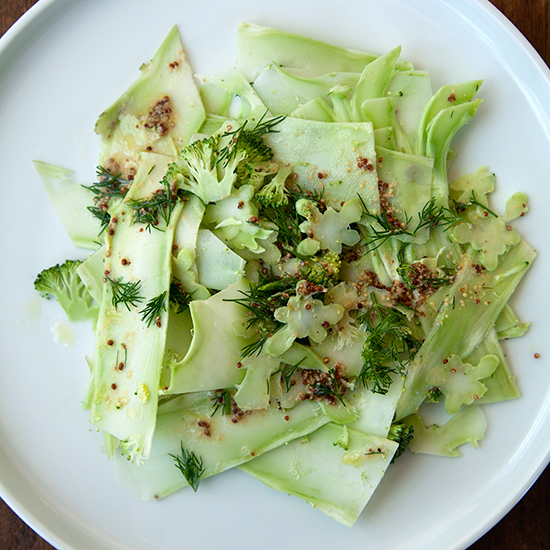 Combine the shaved broccoli florets and stems in a bowl and pour over the dressing. Toss the broccoli until evenly coated, transfer to plates, and serve. The salad will keep in an airtight container up to 3 days. Review Body: Excellent! I used all broccoli stalks that I didn't want to discard. What a great way to use the entire vegetable!